Grass areas need regularly and properly done cutting to be kept in shape and ensure the presentable state of the property. You can rely on the gardeners in our company to implement one-off and regular grass cutting in Bethnal Green which will make your lawn look better. Our services are effective, affordable and will make your grass thicker, rid of weeds, bare patches and pests. It is estimated that regularly mown grass fields develop stronger root systems and become denser. Use our services whenever you need expert consultation, one-off or recurring trimming services. You can use our gardening services whenever you need help with the cares for your plants. Our gardeners arrive on time and bring the mowers with them. They create striped pattern of the lawn to encourage its growth and make it look better. The grass will be cut to the necessary size and this will provoke its thickness and growth. Regularly mown lawns need less watering and are less likely to grow weeds. You can rely on the gardeners in our company to provide effective and inexpensive grass cutting services in and around E1 regularly or upon request. The lawn will be cut and reduced in height to become well shaped. Our gardeners will edge around trees, bushes, flower beds and paved areas. They will remove the created grass debris and gather them in the compost bin. We offer recycling whenever the customer requires it. 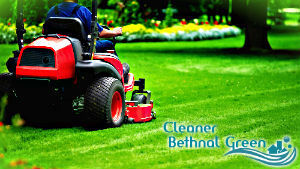 Use our effective grass cutting services which we offer in and near Bethnal Green to ensure the healthy and properly developing condition of your green areas. We provide other gardening services which can be used by homeowners and holders of commercial estates. Use them to maintain the plants in your garden in perfect condition.